The Caterpillar D11 is a heavy-duty bulldozer used in mining, building roads and ripping rocks. It is one of the biggest bulldozers around – beautiful, and very powerful. The idea to build it came during a discussion with a friend about the Israeli military training ground and mine fields in my area of South Mountain Hebron. We discussed how to remove land mines and other military hazards, and what would be the best machines for such work. I said that the D11would be ideal for this kind of work, but my friend pointed out that it would be complicated to make, and unlike any model I have made before. “We will see,” I said. It took me six months to find the materials and to build this majestic Caterpillar. In 2011 I was given a small grant by Ghadir found for Young Emerging Artists. I decided that project would be to build my dream home. At the beginning I thought that I could do it in three months. But a home takes more then three months to build. After a year of working on it I finally built my dream home – and it really is “my” dream home, as my wife Na’ama will tell you! It is about a meeter and a half long and there are eight rooms and a garden on top with solar panels and wind turbine . There is a room for our children Sadin and Lin, for Naama and me and for our friends who come to visit. There is a living room, a play room, a kitchen, shower, bathroom and my workshop. In the meantime, the threat to my real home in Um el Kheir goes on. The last time the military and civil administration came to demolish a house in my village I ran home to take out all of the important things out – you never know which houses they are going to demolish. So I took all the valuable things out of the house, which includes my models. When they come next time I am not sure I know how to take this house out since it is so big. I once saw a film about the John Deere Tractors, and how they helped to advance the world. I also used to work in Ofakim, Israel, on a potato picker, pulled by a John Deere tractor. I worked there day and night until I was caught by policemen for working without a proper Israeli work permit and was sent home. I built this tractor in the nearby village of Susiya. People came to watch me as I worked – men, women, and children. I enjoyed their support and curiosity very much. This piece is built from a piece of iron that was thrown next to the house as garbage. I took it and cut it and added green plastic, the body of the tractor, which somebody brought me from Tel Aviv. The wheels are built from a plastic tube, and I used plastic beverage bottles for the windows. All the pieces are attached by iron wires. The tractor was built during the Muslim month of Ramadan when the heat, hunger, and thirst make it impossible to do anything. 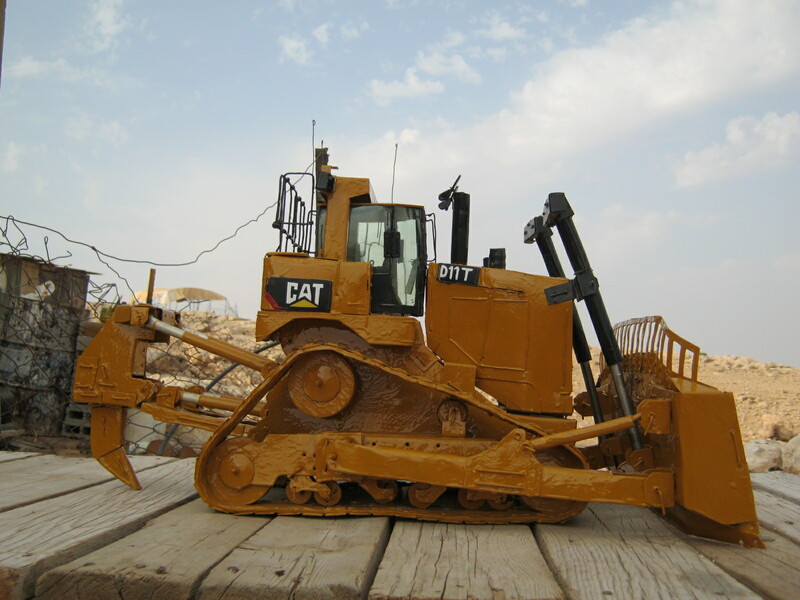 Most Palestinians think Caterpillar tractors are death machines. I asked myself why they blamed this machine, when after all it is the person who renders the machine good or bad. I drew sketches of this tractor on large rocks and on paper. I may have seen one once or twice in my life, but really I remember seeing it on the internet. I thought carefully about how to build it correctly. I like these tractors, how they move, their size… This tractor is made from sawed iron pieces. I requested the iron scrap from somebody in my village, who told me I was crazy and could take the scraps. It was difficult to cut the iron as my tools were not good enough. I felt this tractor in my body and my soul. The tractor took a month to build. The most difficult part was making the plow that picks everything up. The wheels were also difficult to make. I made them from foam board used to make the walls in the nearby Israeli settlement of Carmel. The foam board flew in the wind to Umm al-Khayr’s wadi (valley) where I collected it for the wheels. I cut the wheels according to a plastic circle and heated up iron rods to make holes. I used twisted wire to shape the form board and to make the grooves of the wheel. When I find something I can use for my art, I am very happy, as if I found gold or something expensive. My art is my channel for coping with the hardships of life in the South Hebron Hills and under occupation. 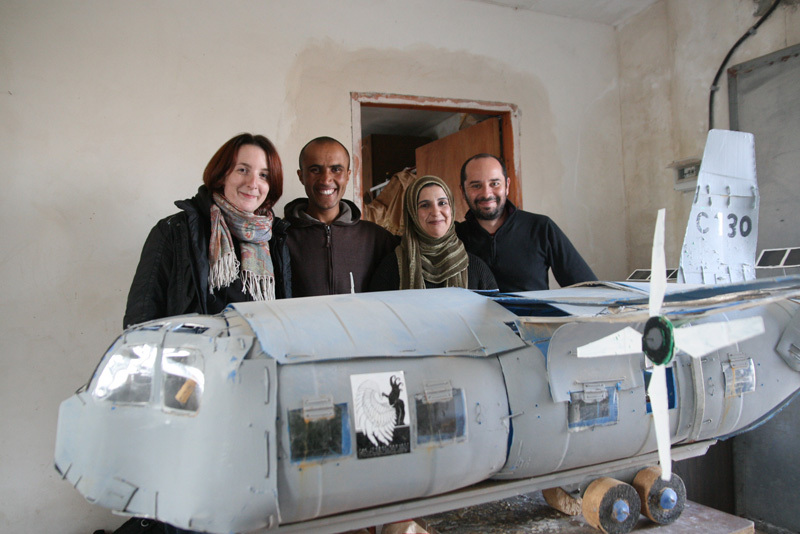 This piece was inspired by helicopters flying above Umm al-Khayr and practicing in the area. This piece was made from a plastic bucket that I found while crossing the valley near my home. The helicopter passed above at the same time as if there was a connection between it and the bucket. In making the helicopter, I found pictures on the internet, and I thought about how they are fast, how they can save you, and about their role in war. This helicopter was built over four days as a companion to the first one. It was also built with a bucket, which I took from my mother. She put up a fight, but in the end she gave in. I used coca cola bottles for the windows of the helicopter and wires to hold everything together. The propeller is made from a small toy with a small turbine that was discarded by my neighbors.